There are many significant events and personalities that deserve to be dealt in more depth, in LKY's autobiography, Memoirs of Lee Kuan Yew. Lee Hoon Leong (1871-1942), LKY's grandfather is such fascinating person. 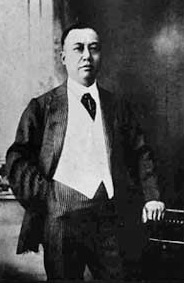 Lee Hoon Leong (1871-1942), is a managing director of the Heap Eng Moh Steamship Company Ltd, owned by the tax farmer, opium cultivator, Oei Tjiong Ham. He has 5 daughters 3 sons and 2 wives. LKY's autobiography has it as below. (Lee Hoon Leong) a purser on board a steamer plying between Singapore and the Dutch East Indies. The ship was part of a fleet belonging to the Heap Eng Moh Shipping Line, which was owned by the Chinese millionaire sugar king of Java, Oei Tiong Ham. In between his travels he married my grandmother, Ko Liem Nio, in Semarang, a city in central Java. There is a document in Dutch, dated 25 March 1899, issued by the Orphan's Court in Semarang, giving consent to Ko Liem Nio, age 16, to marry Lee Hoon Leong, age 26. Chronologically, it appears very likely that LKY's grandma Ko Liem Nio is a minor wife. In addition, sources has indicated that Lee Choo Neo is a adopted daughter. However, the condition of her adoption is obscure. LKY's memoir contains little or almost nothing about his paternal uncles and aunt. Hence, not many know now that his aunt Lee Choo Neo is famous then, for being the first female doctor in Singapore. Lee Hoon Leong lost his fortune in the Great Depression and died just after the Japs conquered Singapore. Kindly email me if anyone has more info.